Located on Lake Traunse in the pristine Salzkammergut region, Gmunden is a great destination for water lovers and outdoor enthusiasts. Although Gmunden is famous for its beautiful Gmunden Pottery, the idyllic little town on Lake Traunsee has plenty more to offer for summer vacationers, including countless recreational options and gorgeous surroundings. In the summer Traunsee is one of the Salzkammergut’s most popular lakes. Boat tours are fun and an excellent way to get a closer look of the lake. Fishers appreciate the peace and tranquility of the lake. On warm summer nights the lake inspires romance with a stroll along the pretty Gmunden Esplanade. Also located on Lake Traunsee is the medieval Schloss Ort castle, one of the Salzkammergut’s oldest buildings. Only 1004 meters tall, Grünberg makes for a leisurely hike. From the top of the mountain you get awesome views of Lake Traunsee and the rugged peaks of Höllengebirge, Traunstein and Totes Gebirge. In the winter there is great skiing in the family-friendly Feuerkogel ski area and on Hochlecken. The area is also popular with ski mountaineers. In the winter, the views of the snow-covered Salzkammergut and its lakes are sublime. Find the perfect accommodation for your upcoming Gmunden trip on Tiscover, whether it’s a luxurious 5-star hotel, a self-catering apartments or a friendly B&B on the lake. The lively town of Gmunden became an officially recognized Spa Resort in 1862. Due to its idyllic location right on the shores of Traunsee Lake, embedded in a stunning mountain scenery, it makes a perfect place for rest and recreation for the whole family. Plenty of cultural highlights and attractions await you! Lovely boat trips on Traunsee Lake with the paddle steamer "Gisela"
Gmunden Millennium Trail "On the tracks of the Horse Railway"
Gmunden is neither a big town nor a peaceful mountain village. A cultural center, a charming place, a romantic and lively spot in the heart of Upper Austria! You will find both restful moments and active days in a very special ambiance. Let your holiday dreams come true - in GMUNDEN. 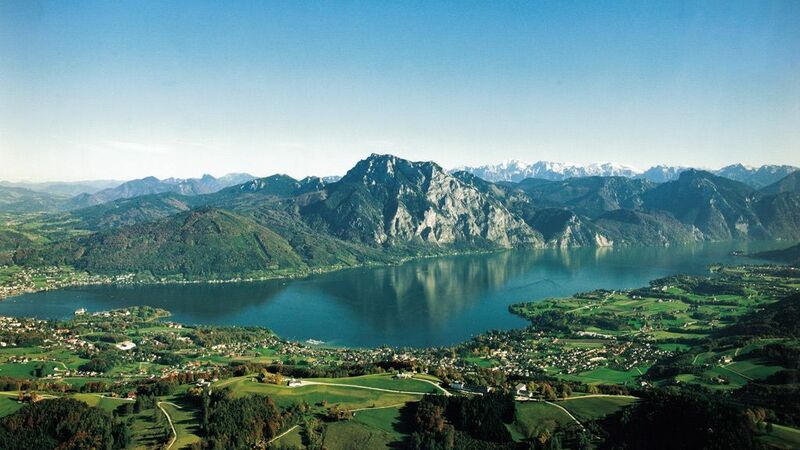 All this and a lot more is waiting for you amidst the outstanding Traunsee holiday region. Events, highlights, culture, nature, sports and activities: the choice is all yours. The lively city with southern charm lost nothing from its attraction since its appointment as spa cure city (1862). Its unique location on the bank of the lake Traunsee, surrounded by mountains, together with its cultural past offers a special flair . Original scene of the TV series "Schlosshotel Orth"
Tram of Gmunden and "Traunsee-railways"
Themepath "Millenium way of Gmunden" and "On the traces of the horse railway"
From Germany via Passau on the motorway A 8 till cross Wels North, further on direction cross "Voralpenkreuz", there in direction Salzburg on the A1 to the mentioned exits.